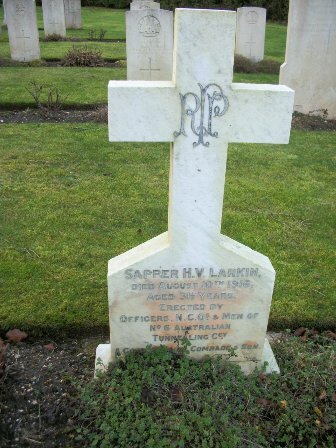 Son of Thomas & Mary Larkin. 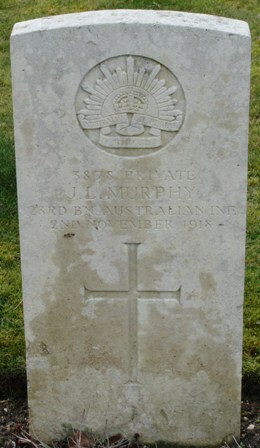 Born at Bunbuny, Western Australia. 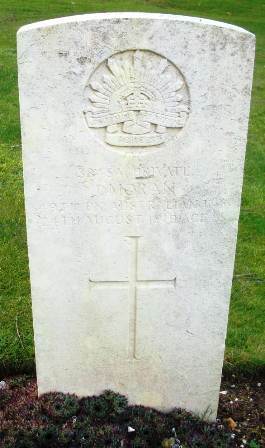 Son of Thomas Archibald & Fanny Matilda Leighton, Cottesloe. 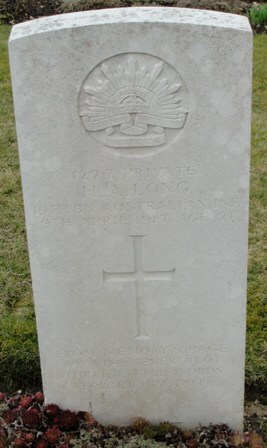 Son of Henry Alfred & Jane Long,Chippendale, Sydney. 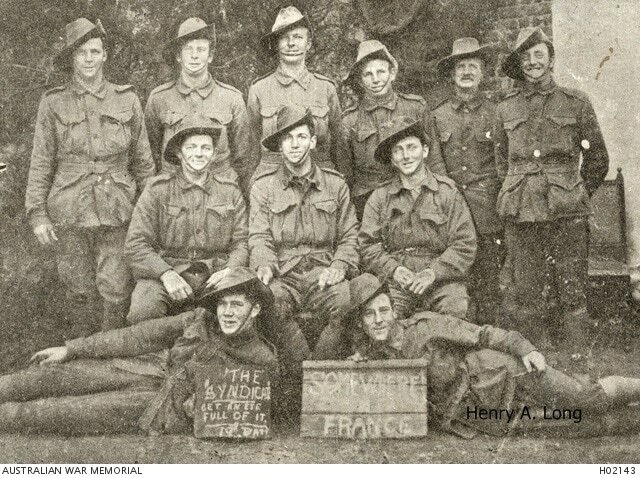 Group of eleven soldiers, known as the Syndicate, from the 19th Battalion, AIF. Identified back row from left to right: 4746 Private (Pte) Alfred Francis McGuinnes and his brother 4747 Pte Walter Edward McGuinnes of St Peters, NSW; 4729 Pte Charles Norman Kenny of Ryde, NSW (died of wounds in France on 3 May 1917); 4727 Pte Reginald Sam Ingram of Ryde; 4265 Pte Arthur Warren of Sydney, NSW; and 1576 Pte Ephraim Ninnim of Sydney (died of wounds in France on 2 September 1918). Seated in second row: 4726 Pte Robert Searle Ingram of Ryde (killed in action in France on 14 November 1916); 3802 Corporal Edward Thomas Foord of Ashfield, NSW (killed in action in France on 15 April 1917); and 4269 Pte James White of Glebe, NSW. 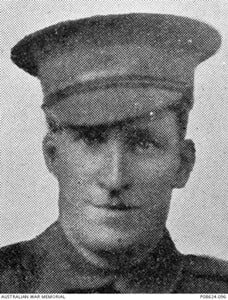 Reclining in the front: 1226 Pte Charles William Leslie (killed in action in France on 3 May 1917) and 1227 Pte Henry Alfred ﻿Long (died of sickness in England on 9 April 1917),﻿ both of Chippendale, NSW. The two signs being held in the front read "The Syndicate. Get an eye full of it. 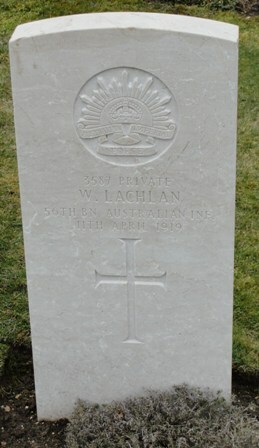 19th Batt." and "Somewhere in France." 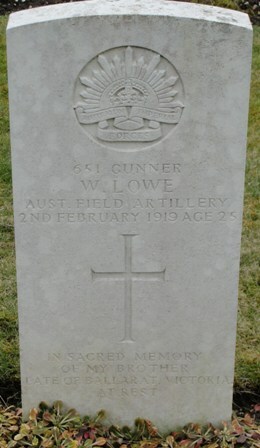 Son of Henry and E. Lowe. 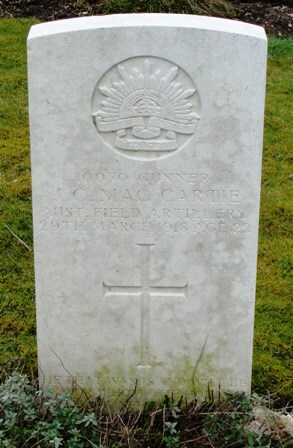 Son of Justin C. and Nora B. MacCartie, Billinudgel, New South Wales. 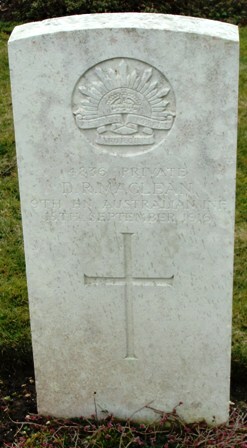 Son of Donald F. & Jessie Harriet MacLean,Cleveland Line, Queensland. 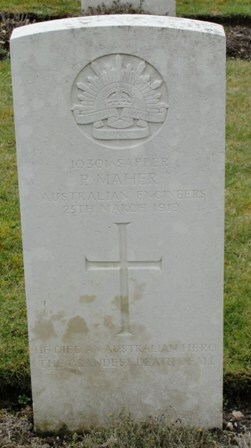 Husband of E. Maher, Ballarat. 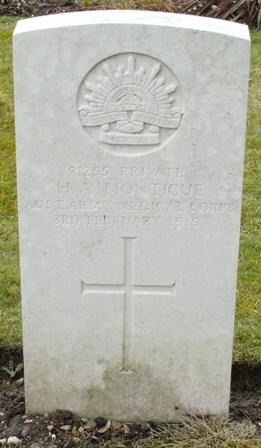 Husband of Alice Matthews, Folly Point, North Sydney. 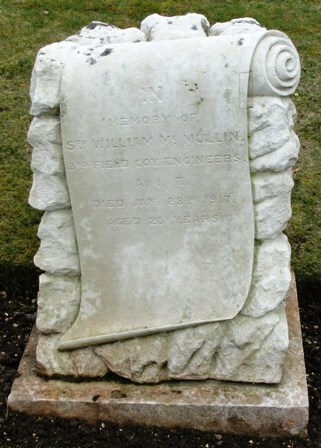 Born at Tipperary, Republic of Ireland. 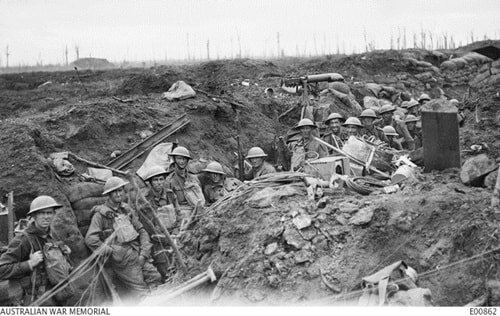 Members of B Company 3rd Battalion, in the 'jumping off' trench at Clapham Junction, from which the Australian troops of the 1st Division commenced their opening attack in the Third Battle of Ypres. 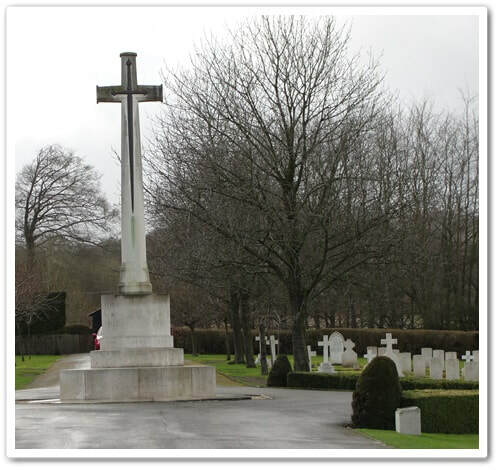 Identified, left to right: 6725 Private (Pte) W Castle; unidentified; 1307 Private E J Blacklock; 3054A Pte Robert Daniel; unidentified; 2343 Pte J A Larkin; 2478 Pte G W Matthews; 5683 Pte W A D Howard (also identified as 6756 Private Leslie John Gottwald); 6156 Pte Gordon Oliver Foley; next two unidentified; 164 Corporal W Marshall DCM; 5027 Pte Vincent Amiet; the other men, partially obscured, are unidentified. 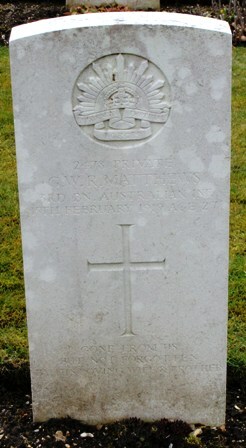 Son of John& Rebecca Matthews. 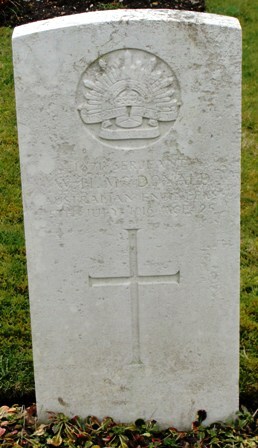 Son of Duncan R. & Alice A. McDonald,Nimmitabel, N.S.W. 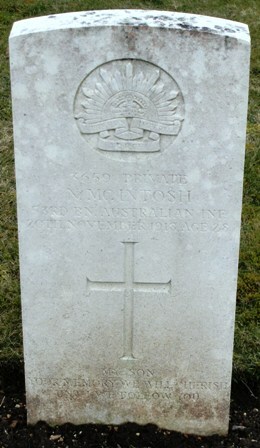 Son of James & Mary McIntosh, Canterbury, Sydney. 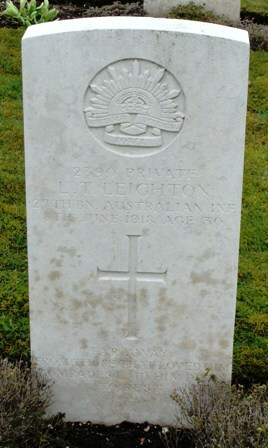 Born at Wellington, New Zealand. 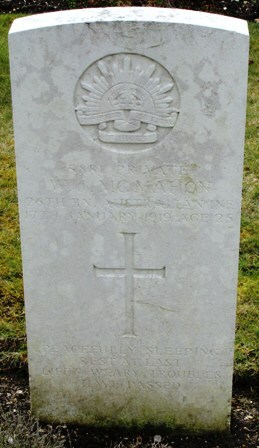 Son of James & Annie McMahon,New South Wales. 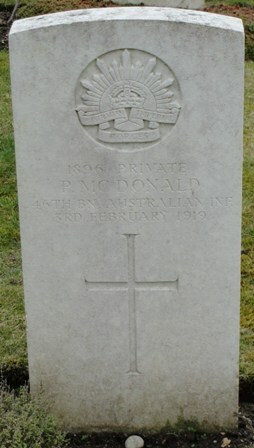 Son of William and Elizabeth McMullin, Toowoomba, Queensland. 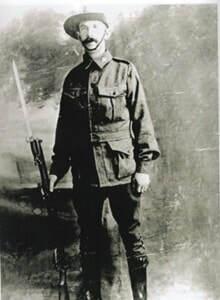 Studio portrait of 4837 Private Francis McNamara, 2nd (later 54th) Battalion of Parramatta, NSW. 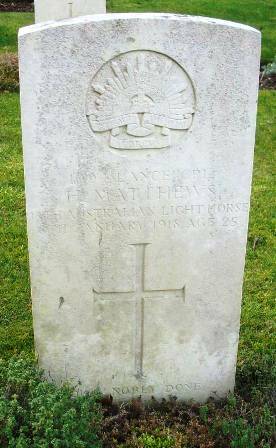 A labourer prior to enlisting, he embarked from Sydney aboard the HMAT Star of England (A15) on 8 March 1916. 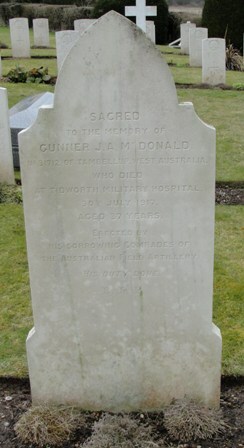 He died of pneumonia on 16 December 1916 at the Delhi Hospital, Tidworth, England, aged 36. 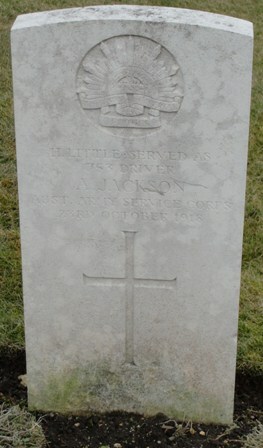 He is buried in the Tidworth Military Cemetery North Tidworth, England. 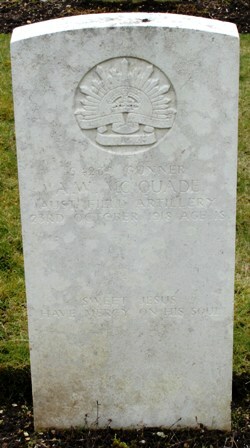 Son of Arthur Joseph &May McQuade, Leichhardt, Sydney. 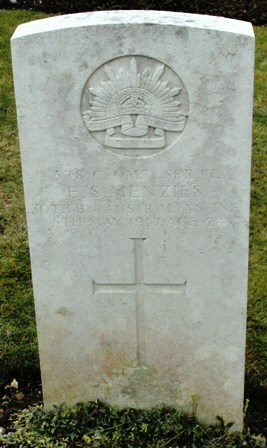 Husband of Ina Eileen Menzies, Coogee, New South Wales. 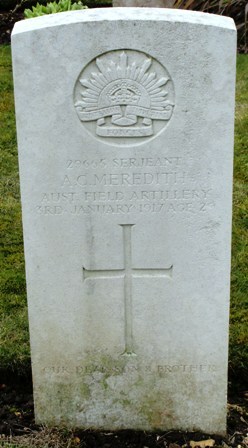 Son of Charles T. and Annie Meredith, Kew, Victoria. 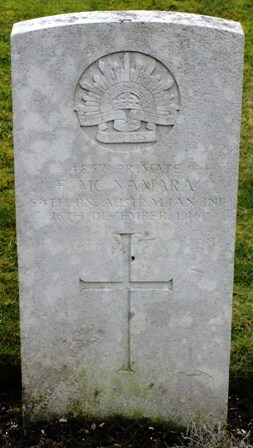 Son of George M. & Jane Murray, Bayswater, Western Australia. 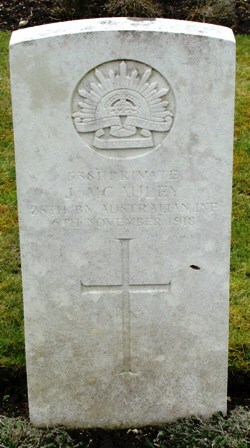 Son of William & Alice Murray, Orange, New South Wales.